Mayo v Roscommon match fixed for 2/2/1947 postponed. Mayo v Cavan match fixed for MacHale Park on 9/3/1947 postponed. Mayo v Leitrim match fixed for Mohill 23/3/1947 postponed. Due to the extremely adverse weather across the country in February and March 1947, it was decided (see Irish Press, 17th March 1947) to abandon completion of the 1946/7 NFL, with the competition being replaced by a knockout tournament involving four counties – Derry, Longford, Wicklow and Clare. This was won by Derry who beat Clare 2-9 to 2-5 in the final. FIRST ROUND: Mayo 0-4 Roscommon 1-10 (James Stephens Park, Ballina, 25/5/1947). MAYO: T Byrne; P Gilvarry, P McNamara, S Flanagan; J Staunton, P Carney, J Munnelly (Ballycastle); T Langan, John Gilvarry; S Daly (0-2), H Dixon, Joe Gilvarry; J Munnelly (Castlebar) (0-2), T Gilvarry, T Acton. As is pointed out in the match result archives contained in The Road to 51, this was the infamous match where the Mayo team found itself without the sufficient number of substitutes and it is not at all clear that the team listed here, which was the one selected to play, actually lined out as selected on the day. 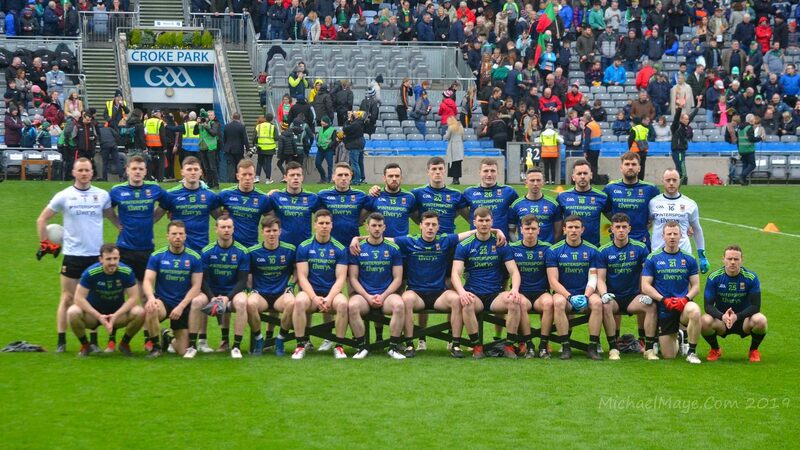 It was arising from this game that the Dublin-based players issued their famous letter to the County Board demanding that action be taken to restore the county’s fortunes. Mayo 1-4 Galway 0-3 (MacHale Park, 23/11/1947). MAYO: T Byrne; P McNamara, E Mongey, T Quinn; M Heaney, S Flanagan, John Gilvarry; J Forde, S Daly; T Langan (0-3), T Acton, J Munnelly (Ballycastle); J Munnelly (Castlebar), J Mulvey (1-0), A Wilson. Sub: Joe Gilvarry (0-1). FIRST ROUND: Mayo 4-4 Galway 2-2 (MacHale Park, 6/7/1947). MAYO: J Cassidy; M Cannon; P Flanagan, F Walsh; J Sheridan, A Morrissey, P Doherty; N Kane, M McDonnell (1-0); M Loftus (0-1), P Carroll (0-1), C McHale (1-0); M Mulderrig (0-2), P Solan, M O’Connell (2-0). SEMI-FINAL: Mayo 0-7 Kerry 1-1 (MacHale Park, 24/8/1947). MAYO: A O’Toole; M Cannon, P Flanagan, J Sheridan; A Morrissey, P Doherty, N Kane; T Walsh, M McDonnell; M Loftus (0-1), P Carroll, C McHale; L Ruane, P Solan (0-5, one free), G Gallagher (0-1). Sources used: Padraig Ferguson’s Archive, Complete Handbook of Gaelic Games, The Road to 51, Irish Press, Irish Independent, Connaught Telegraph, Western People, Ballina Herald.